Luxury apartment, LOFT 25 Fabulous 1 Bedroom easy convertible to 2 Bedroom / 2 Bath LOFT Featuring Sleek Custom Schiffini glass kitchen, Bosch appliances and professional grade range hood. Two bathrooms featuring ceramic floors, a walk-in shower with Nobili Spa rainhead and custom teak vanity. There is abundant closet space and a washer/dryer, as well as additional private storage. Approximately 1,183 square feet and 14 feet Hi Ceiling. This unit is not on the ground floor but located between the first and second floor allowing some privacy. This pet friendly condominium features two elevators, gym, private screening room, rear garden courtyard and magnificent common roof deck of approximately 5,000 square feet with gas grills, an outdoor shower and bathroom. Located in the heart of West Chelsea's gallery district and close to The Highline and Hudson River Parks. 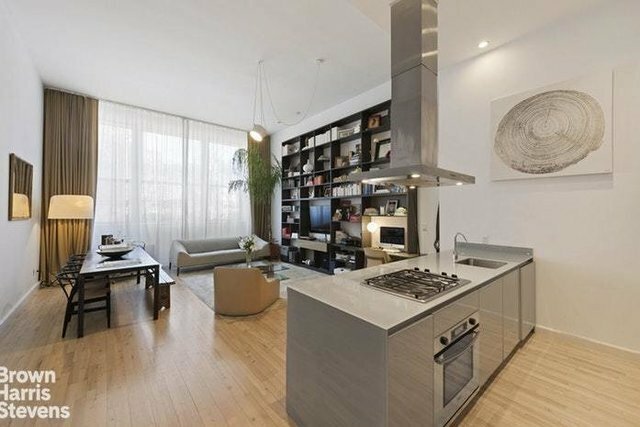 Convenient to the city's best restaurants and shopping, nearby specialty food stores include Whole Foods, Fairway, Gristedes, Garden of Eden, Trader Joe's, Chelsea Market and Eataly.. Transportation: C, E & 1 subways and 23rd Street crosstown bus. Furniture are also available for sale.